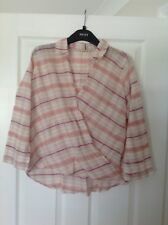 Women’s HOLLISTER Shirt Size Medium - Pink & White Stripes. Condition is New with tags. Dispatched with Royal Mail 2nd Class. 100 % Genuine Hollister, RRP £17. Women’s Hollister Slim Fit Stripped Long Sleeve Top Size Medium. Condition is Used. Dispatched with Royal Mail 1st Class. PINK WHITE. LONG SLEEVE. SIZE SMALL. LENGTH 26". Hollister Pink And White Stripe Off The Shoulder Top XS. Condition is Used. Dispatched with Royal Mail 2nd Class. Pattern: Stripes. Label Size: Size 6 XS. Colour: White Pink. Type: Top Long Sleeve. Material: Cotton. Hollister pink and white stripped long sleeved top. Worn only once sorry it's abit creased my iron has broken. Hollister pink/white striped top with shirt/half sleeves. Blue trim. Size medium. Condition is used. Please see photos. Ladies Holister Shirt Size L Im a size 12 and this fits me perfectly. Very good condition. Pink and white striped shirt bought from holister at bluewater. Dispatched with Royal Mail 1st Class. Ladies/girls Hollister TShirt Size XS Pink/White stripe. Short sleeved pink with white striped TShirt from Hollister. Size XS. Lovely soft fabric. Excellent used condition. The top is in used condition. I don't accept e-cheque because it takes too long to clear. Lovely hollister pink/blue striped top size xs. Condition is Used. Item from pet and smoke free home. Hollister pink and white striped long sleeve T-Shirt - size XS - very lightly used - in great condition. has Hollister logo on hemline. Type: Vest Top. Pattern: Stripes. Colour: Pink White. Label Size: Size 16 Large. Pink and white stripe short sleeve t-shirt. Holister pink candy stripe Top XS. Condition is Used. Dispatched with Royal Mail 1st Class. Top from Hollister. size L like 14.